Today I decided to do a circuit for my 43. I wanted to get some toning, cardio, plyo – basically some of everything in one quick round (well actually 43 rounds!). 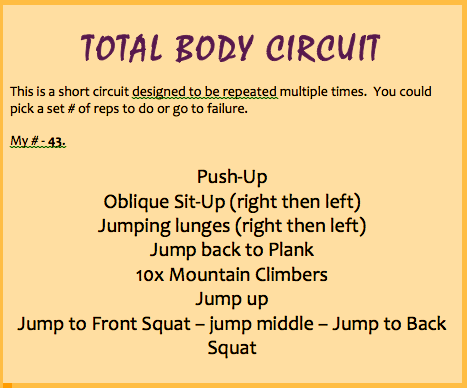 Looking at the circuit you might think it is no big deal – try a few!!! The first 10 or so weren’t terrible – but the last 10 were brutal!!! A tough 43 for sure!!! I think part of the challenge came from the fact that I kept going from floor moves to standing – constant up and down. It was a good workout for sure!!! I’m not sure what is going on with Phil the groundhog – I think he was a little off this year. 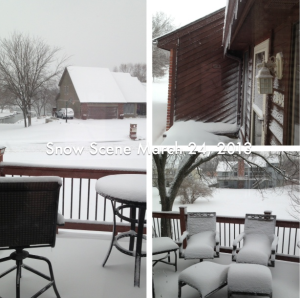 On a happy note – I finally figured out how to make a picture collage!!! Thanks to Lindsay at The Lean Green Bean for sharing her favorite 30 Apps for the iPhone the other day – I learned about Diptic!! Even though my Grandmother is no longer here, today would be her birthday – Happy Birthday, Mema!! I miss you every day!! !